Kybele would like to acknowledge the passing of Dr. Jonathan Kumah. Kumah was a specialist physician anaesthetist we worked closely with at Ridge Regional Hospital in Accra, Ghana. He died on August 19, at age 52 after a brief illness. Dr. Kumah was a man of wisdom, vision and quiet determination. He started the recovery room and anesthesia pre-operative clinic at Ridge. However, his greatest achievement was the founding of the Nurse Anesthesia Training School in 2009. It was only the third such school in Ghana. Kumah wrote the proposal for the school and defended it through the highest ranks of the Health Ministry and the Ghana Health Service. Kybele was asked to assist in the curriculum development for the school, and that curriculum was later adopted as a national curriculum for all the nurse anesthesia schools in Ghana. 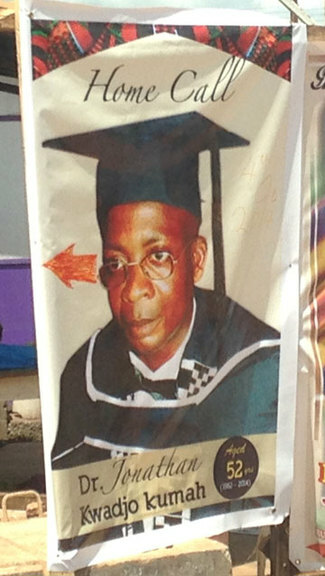 Kumah served as head of the school from January 2009 until his untimely death. He is survived by his wife and four children. We express our deep condolences to Dr. Kumah’s family, our Ridge family and to the Ghana Health Service.